And now it looks like this!! Yay for progress! First let’s mention a few disclaimers… This post is strictly about the paint change. So except for admiring the pretty new comforter, pillows (which some are staying, some are borrowed from another rooms, and others probably won’t stay), and the new bed… This room is NOT decorated in any form or fashion. This is definitely an “in-progress” picture. But I couldn’t wait to show the difference a coat of paint made! If you remember back in this post I was a little discouraged. I didn’t like the 2 paint colors I picked out, I was having problems with refinishing the furniture, and things were just taking a lot longer than expected. I LOVE this color and I am so glad I changed to it even though it postponed my painting progress. And it really hasn’t made the room feel “dark” at all – May be hard to tell that in these pictures as we have had several overcast days and it is just hard to capture it perfectly camera keying my limited skills. The paint is used is a new line of paint by Behr called Marquee and the color is “Magnet.” I used the exterior version of this paint on my shutters and front door when I painted them black. But this is the first time I have used the interior version and I am extremely impressed. 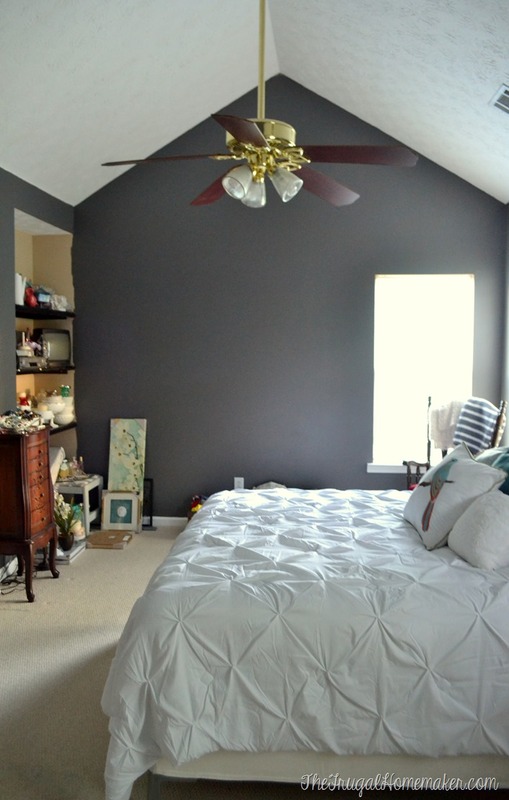 Behr Marquee Interior boasts a one-coat coverage guarantee and it really does cover in ONE coat. I painted this entire room with one gallon of paint and with one coat of paint. That is amazing considering how much darker the new color is from the previous beige color. Just for fun I did a little test on the wall. 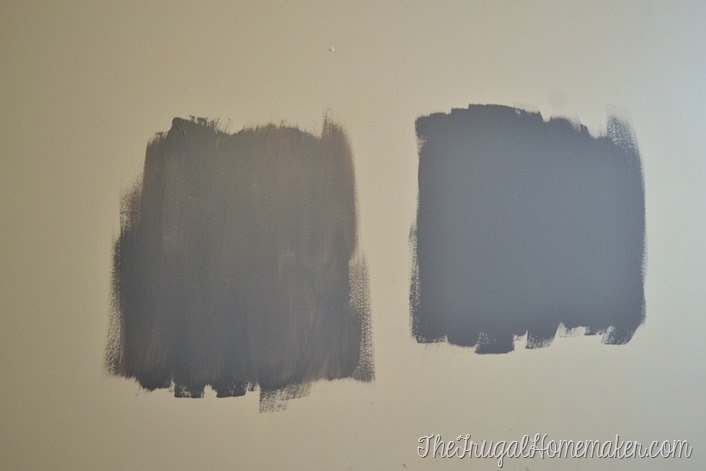 On the left is a color called “Granite” and it is mixed in Behr paint and primer on one. 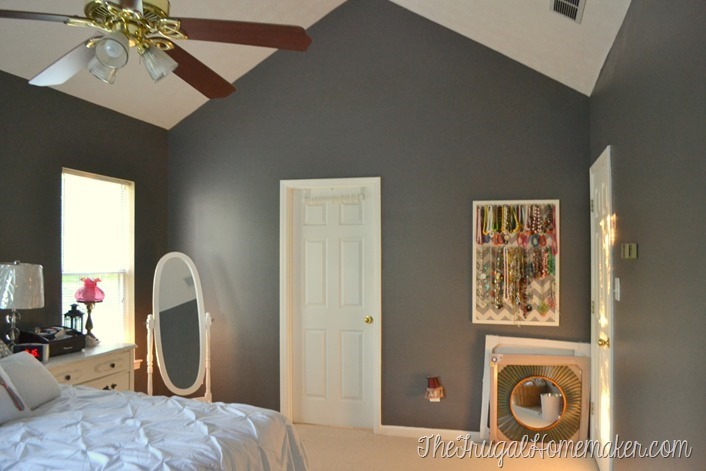 And on the right is my wall color, “Magnet” by Behr Marquee. I brushed both of these colors on with a paint brush. See how the paint on the left you can already tell is going to require a second coat and the paint on the right is already fully covered only brushed on in one coat. If you see the ceiling height and the size of this rooms you can see why I definitely did not want to do more than one coat if at all possible. Oh I love this deep, moody, comfy look! I loved every picture I saw of dark gray paint in bedrooms with lots of white accents, but I had never gone this dark EVER in my house ion a whole room. 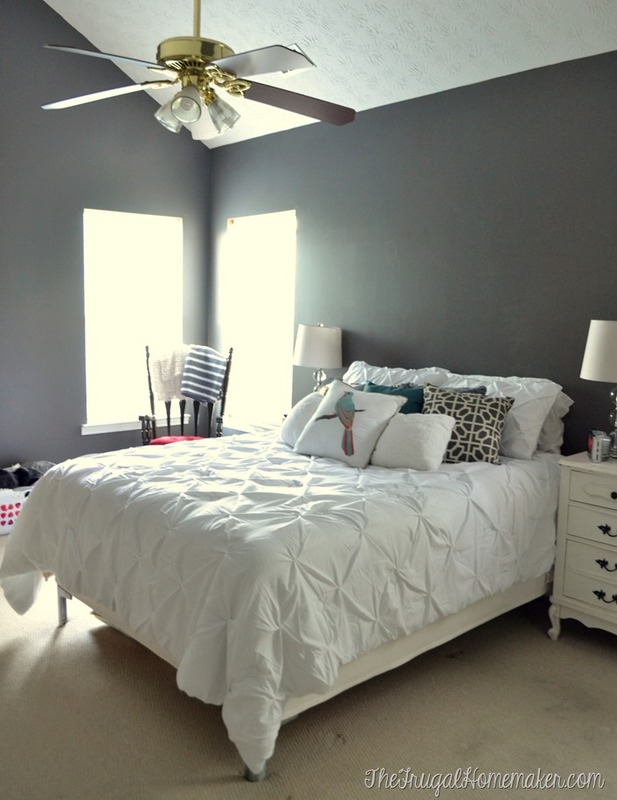 I was a little worried I wouldn’t love it, but you guys… I may paint every bedroom my house a dark color! The way the white trim pops against the dark paint- LOVE! I am still working on night stands and I am thinking that I will use this small painted white dresser (you can see where I refinished it here) on the other side of the bed, and paint another small dressers that is a bit smaller than this one to go on this side of the bed. I plan to have a tall chest of drawers in the corner on the right side of the bed so using a smaller dresser on that side will work better. Of course all of that could change once I get all the furniture in the room and see what fits where best. Now for the fun announcement! As you are reading this post I am probably 10,000 feet in the sky on my way to California! I was invited by Behr to attend a Behr VIP experience celebrating the launch of this new paint line of Marquee paint. The exterior line has been in Home Depot stores for several months and the interior line has been slowly rolling out to select stores this summer. But by the end of September, you should see the Behr Marquee Interior line in every store. I get to take a tour of the Behr plant in California and I will be sure to share some pictures on Facebook and Instagram so make sure you are following me there! So exciting! I have never been to California or seen the Pacific Coast so I am excited to see that as well. You can learn all about Behr Marquee, their one coat guarantee, and see all of they colors they have to offer by visiting this link. So what do you think of the new color? 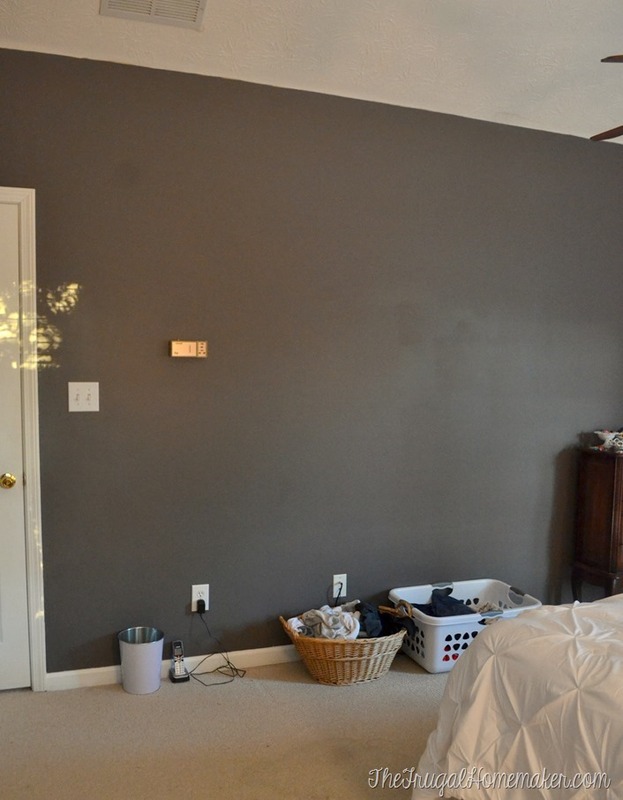 Have you or would you paint a room in your house this dark? 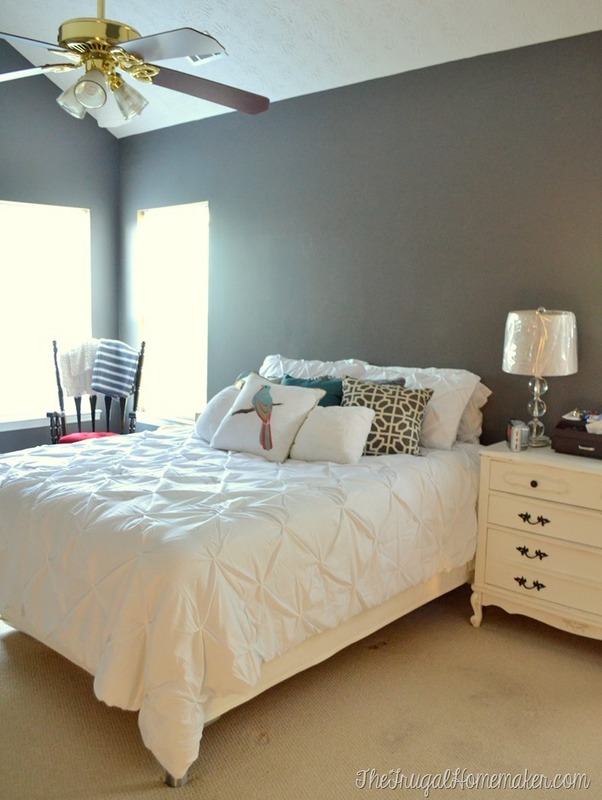 And how amazing is it to be able to paint a room in a dark or bright color in ONE coat? It looks fantastic!!! And who doesn’t want a paint that truly covers in one coat! (I’d love to see how it covers red 🙁 ) Spectacular color, too! You’re keeping me inspired. 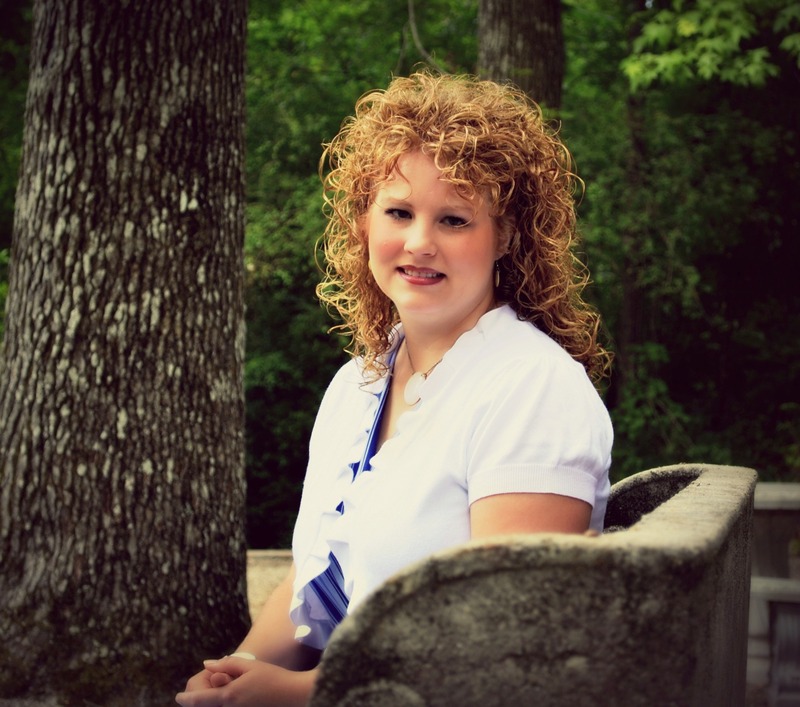 My master is next on my list! Wow your room looks amazing! And I love the idea of only one coat of paint! 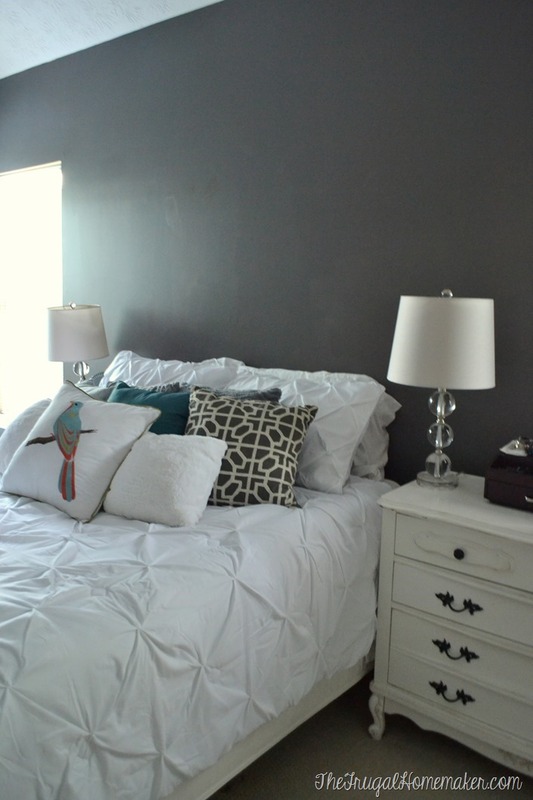 I love the dark walls but most of my furniture is dark so I would be afraid to try it in my home. I can’t wait to check out their other colors! Have a safe trip! Looking good. 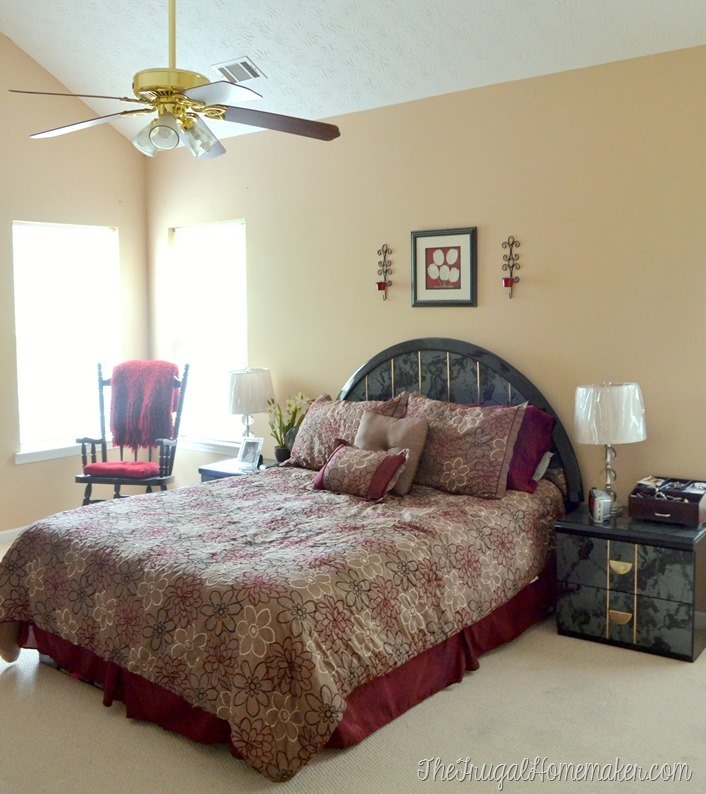 I like the color you chose and can’t wait to see the room once you have it all put together. I love it! We just finished painting the interior of our house…. Minus one room. The laundry. I went with a light neutral color, And now Im wishing I could start over again, today, and use the Magnet color you used! Its stunning!! 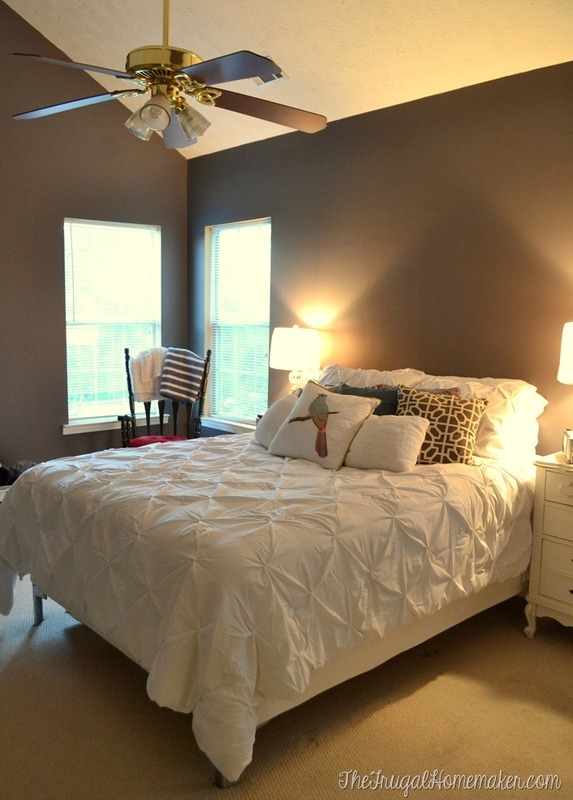 Like the new paint color a lot and that’s a beautiful comforter! It’s beautiful! Bold choice, I must say. But a spectacular one at that. Especially with the light colored furniture. Which, by the way, I LOVE your side table! I can not wait to see more progress. And thank you for keeping everything frugal. It is so useful. Just bought a similar color in Bear Marquee – excited for the change! What a trendsetter! Painting with Greys before everyone started painting everything Grey / Black / White. Happy to hear that you had great success with the Marquee product.